Look how happy my dad and Peggy are in this picture. Could it be due to the fact they were about to fly to Seattle and then depart on a two week Alaskan cruise? Is the fact they will be enjoying mild (60ish) temperatures and breathtaking scenery while I hide out as much as possible in my air conditioned bubble (praise, glory and thankfulness!) to avoid 300% humidity and 90++ degrees temperatures making me at least a shade green with envy? I love that old Johnny Horton song North to Alaska, by the way. 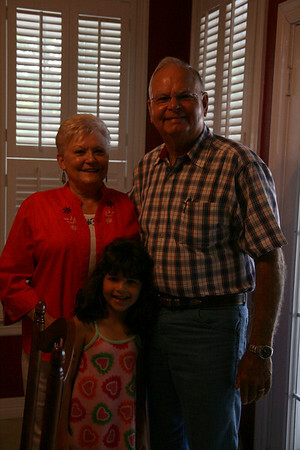 Scott drove them to the airport Sunday morning (good son-in-law marks) and they popped in here for quick goodbyes and a photo. My dad is smiling but his face also says, "Hurry up and take the picture, we've gotta get on the road so we can sit in the airport for 1.5 hours." Scott also earned more good son-in-law marks because the evening before they left my dad decided he HAD to have an iPhone so he could monitor the stock market like a hawk while they are gone and Scott offered to *help* them make their purchase. Two hours, three salespeople, and thirty minutes after the AT&T store closed, my dad and Peggy were the very overwhelmed and confused yet proud owners of two new iPhones. Bless everyone's little heart involved in that transaction. 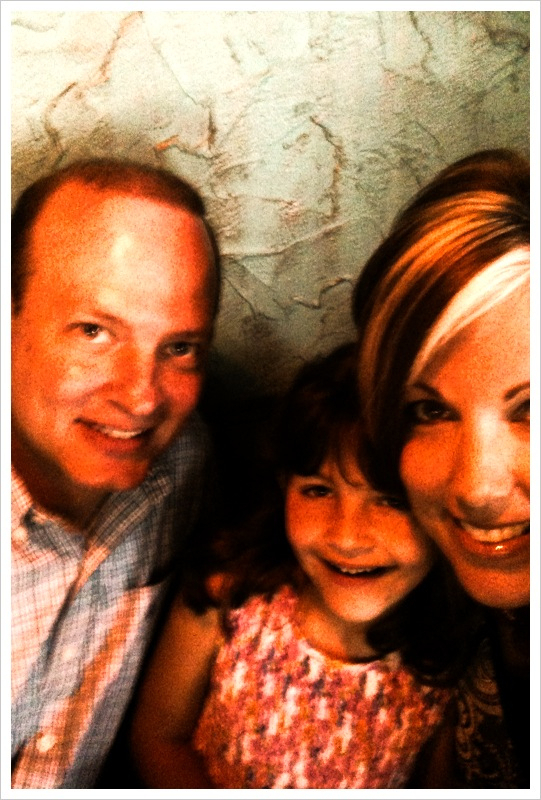 Sunday after church we made a beeline to a new Tex-Mex restaurant in our area (yes, there is one on almost every corner, but they are not all the same), Cafe Adobe, to have an early birthday lunch since Scott's actual birthday fell on Memorial Day. Their seafood enchilada is OUT OF THIS WORLD, let me tell you. Their shrimp taco is not too shabby either. After lunch we stopped by the mall so I could surprise Scott with a present of new cologne. Or aftershave. Or whatever you call it. Turns out he wasn't surprised at all once he sniffed several versions, decided on one and watched me pay the extra flamboyant Dillard's salesman. After almost ten years, Scott is trying a new cologne (from Abercrombie & Fitch Woods to Chanel Pour Monsieur in case you were dying to know). Hooray! Hurrah! Memorial Day (and Scott's actual birthday) was ultra looow key, just hanging around the house, but Scott didn't seem to mind. I did make him a cake. From scratch. I know. 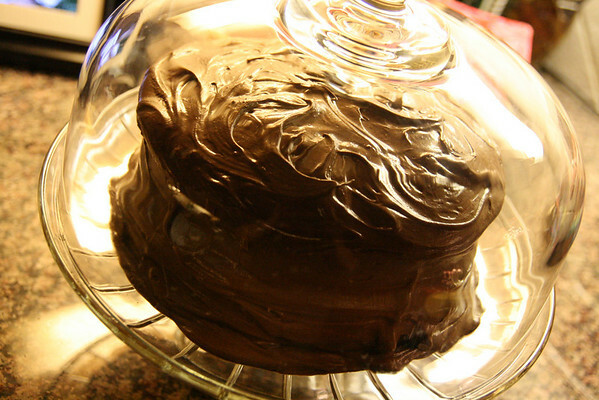 As I was merrily mixing away according to my trusty but seldom used Betty Crocker cookbook (yes, her, really) I realized baking cakes from scratch wasn't as hard as I had imagined in my head. Of course I have baked cakes from scratch before, but they have usually been what I consider specialty cakes like Italian Cream Cake or something, not ordinary yellow cake which is what Scott requested. He actually wanted me to use a mix (because he remembered how moist the last yellow cake was) (and I really wish there was a a better descriptive word than moist) but I was feeling rather stubborn about not adding unnecessary preservatives and chemicals to our sugar loading festival. I also mixed in 1/4 cup of brewed coffee to the chocolate frosting because that's what PW would do and I was feeling rather devilish. He later said the cake was *good* but then he reminded me how much he had liked that last cake mix cake with canned frosting because it was so moist. Do you think that statement went over well with me and Betty? I did concede that I might have baked the cake five minutes too long and that might have dried it up a smidge, but it was still better than chemical cake. I also told him to scoop another scoop of Blue Bell vanilla ice cream onto his cake and all would be fine. When we were at the mall Sunday we had to stop by Paradise, I mean Build-a-Bear, you know, just to browse (although a certain six-year old hoped we would buy her something for Scott's birthday too). We didn't cave, but in an effort to show solidarity I told her I wouldn't even go into Ann Taylor LOFT because we were shopping for Daddy. Tuesday afternoon I heard this repetitive shaking sound for several minutes followed by a loud, "Mama, come here!" She had shaken all the money from her piggy bank and counted out 18 pennies, thinking (hoping?) the Build-a-Bear tiger only cost 18 cents. I told her that she needed 18 dollars. Her bubble burst...momentarily. A few hours later, after scrounging her many hiding places and wallets, she counted out 18 dollars into my hand and asked if we could go to Build-a-Bear after supper. I asked her if she really wanted to spend her money on one thing, reminded her that once she paid for it most of her money would be gone, it would take a while for her to get that much money again, was she absolutely sure blah, blah...BLAH. She assured me she understood and that her life could not go on as she knew it until she had that tiger in her hot little hands. So, without further ado, I'd like to take this opportunity to introduce you to one very happy little girl and her new ferocious tiger friend...Luke. Luke, as it turned out, was only $16, so Annelise picked out a shirt for him (Scott ended up floating her $3 so she could get the whole shirt and not just a sleeve). She was mighty proud of the fact she was spending her own money (mostly) and made sure the Build-a-Bear staff knew that. This girl, she kills me. Do your parents try to embrace technology? 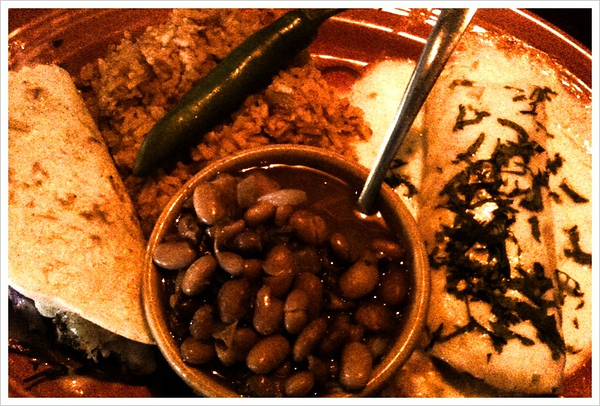 Have you ever tried a seafood enchilada? Does the word moist make you cringe too? 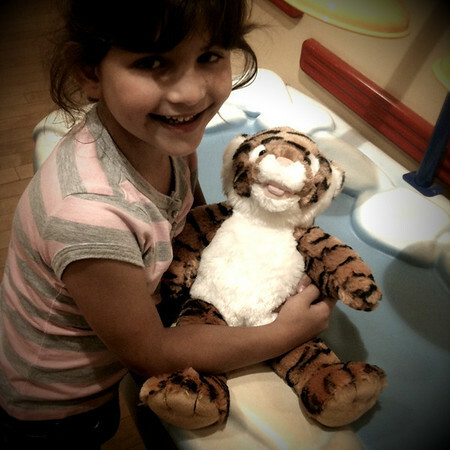 Can you believe she named her tiger Luke? Whoever thought of build-a-bear is brilliant... My niece had her birthday party there. The party really just consisted of buying every child a bear and dressing it. No games, no cake, really odd but the kids LOVED it and of course the store made a bundle. If only it had been my brainchild! Oh yeah, my mom is all up on the technology and knew how to text years before I did. Nope to ever trying a seafood enchilada. What kind of seafood was in it? Nope to baking from scratch except chocolate chip cookies. Haha, never thought of it before but now I am replaying a scene from The Nutty Professor in my head. Oh goodness. I love that you suggested another scoop of ice-cream to make the cake more moist...that made me laugh! So you are not alone in that. My Mom is pretty technologically savvy. Once she has seen how something works she usually jumps right on it. She recently got a cell phone with a keyboard so we can text. My Dad, not so much. I do like making cakes from scratch, just made a chocolate sheet cake last night. But my kids do prefer the boxed variety. They are awfully moist! WHY do kids spend all their hard-earned money on stuffed animals? That's all my little ones ever ever buy. Lame. i love how you can interpret your dad's expressions. alaska?! that's my country!!! the iphone story is making me just giggle. and yes- moist makes me cringe- when it's attached to ANYTHING. but that cake! oh man! the food pics are driving me nuts! i love the pictures and post on a's dance recital! she is so adorable- and talented!!! They went on their cruise with some friends from church, one of them also has an iPhone, so they might come home techie experts. Well...maybe. ;) They email, but don't text. The seafood enchilada had shrimp and crawfish and a deliciously rich cream sauce. I'm still thinking about it. Karen: I know! Why didn't we think of the Build-A Bear concept?!?!? LOVE me some seafood enchiladas! I never bake from scratch. Ever. And everyone is happy about it. And cute about Luke. :) We have stuffed animal fever over here, too. We HAVE to have them, obsess over buying them, save all our money for them, LOVE them for a week and carry them everywhere, then shove them in the toy box and forget they ever existed! Kills me. I sometimes bake from scratch, but like your husband I tend to prefer cakes from box mixes, which is sad I know. at times my mom (or my daughter) has to help me w/ technology! yes, yes, yes, seafood enchiladas, yum! haven't heard of cafe adobe, where is it? I tend to think all the tex mex places are pretty much the same. and none of us can agree on one. yes, I bake from scratch. if you want to use a box mix, HEB does have an organic cake mix (and it tastes good too), but if I remember right it is not w/ the other cake mixes. think it's w/ the bread mixes. hm, I'll have to look for it. Silken: Cafe Adobe recently opened up near Baybrook Mall where the old Bennigan's used to be--next to Olive Garden. I guess they are pretty similar, but we have a rotation of our favorite Tex-Mex places.